The railroad closed up shop and pulled the rails almost a century ago leaving the depot empty and forgotten. The stopes went quiet in the last of the great mines more than sixty years ago and only the eroded tailing’s remain. The traffic from Kingman to Las Vegas and from Las Vegas to Kingman flows along the four lane, modern incarnation of U.S. 93 about five miles to the south rather than through the heart of the old mining town on US 466 as it did until the late 1940s. Scattered throughout the southwest are dozens of towns with similar histories of boom and bust, prosperity and decline, but unlike many of those, Chloride still has a pulse. Retirees have discovered its quaint charm, quiet streets, and friendly neighbors. Eccentric artists have found inspiration in the vast landscapes that embrace the old town and equally inspiring old buildings that easily transform into galleries. Hermits can immerse themselves in the solitude of the surrounding hills and those trying to keep a low profile for a myriad of reasons find refuge here with few questions asked by neighbors. Few who scurry toward the glitter of Las Vegas are aware of this little oasis. Likewise with those who somberly return home after a visit to the town that never sleeps. Every year, on the fourth Saturday of June, all of that changes as the town turns out to celebrate Old Miners Days. 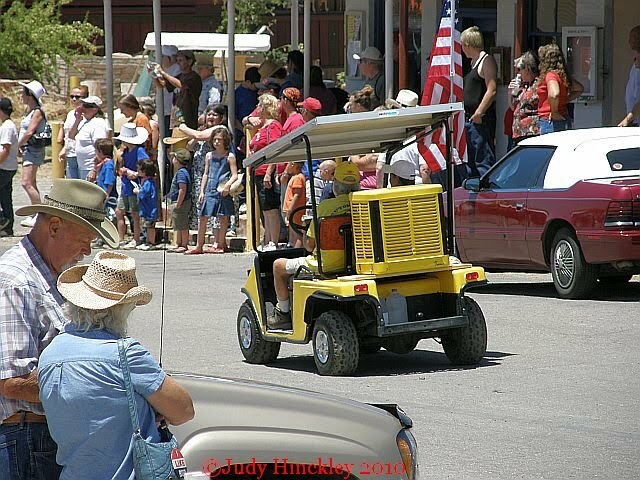 For the briefest of moments the streets again teem with activity, a parade rolls through town, and visitors from far and wide discover, or rediscover this charming little time capsule where the past, the present, and the quirky collide. As the featured artist I had a place of honor perched high above Tennessee Avenue, the main parade route, on the porch of the Mine Shaft Market. Here I had my table for book signings, a shady place from which to watch the excitement, a view of the thermometer as the temperature climbed from eighty degrees to ninety degrees, a nice breeze, and when customers opened and closed the door from the store, a chilled air conditioned blast. People, lots and lots of people. I spoke with scores of people from as far away as Berlin and filled another page in the note book with contact information including a former highway patrolman (US 93 at Wikieup 1960 to 1970), the eldest patriarch of a family that began their trucking company in California in 1910, and an interesting fellow who went to school in Chloride during the early1950s. My dearest friend and I have a long association with this old town. 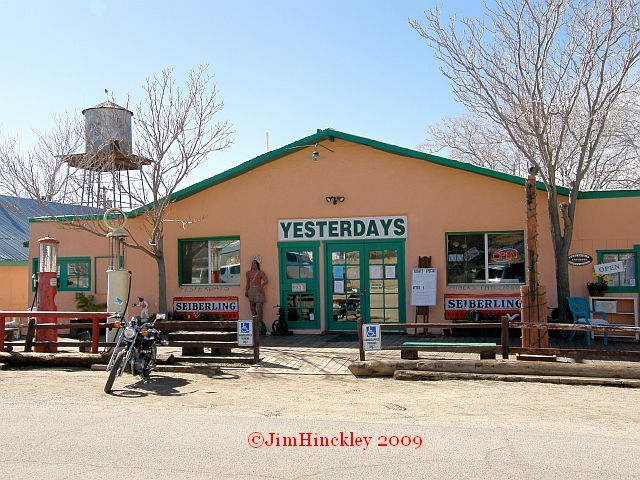 As it is less than twenty five miles from Kingman we used to come here often for dinner when dating. We still slip away to Yesterday’s when we need a break but the budget, financial as well as time, won’t allow for extravagance. Her uncle grew up here, moved here after retiring, and his home became ground zero for family gatherings. His final resting place, as well as that of his father and mother, are in the cemetery overlooking the valley to the south of town. 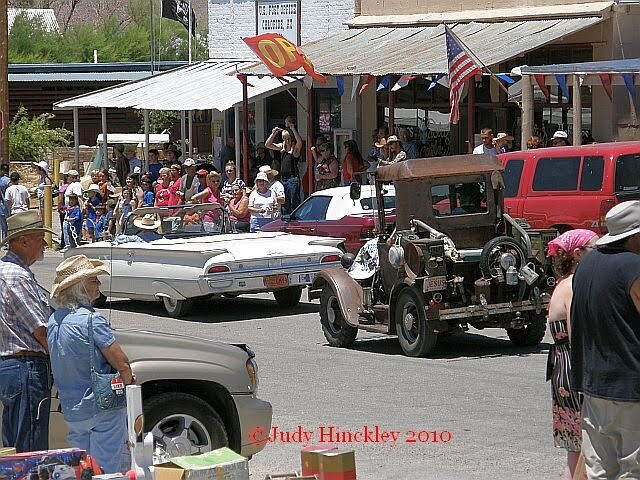 Today, we added a new chapter to our association with this historic town, billed as the longest continuously inhabited mining town in Arizona, and marked the calendar to be sure we are here for next years Old Miners Day Celebration. 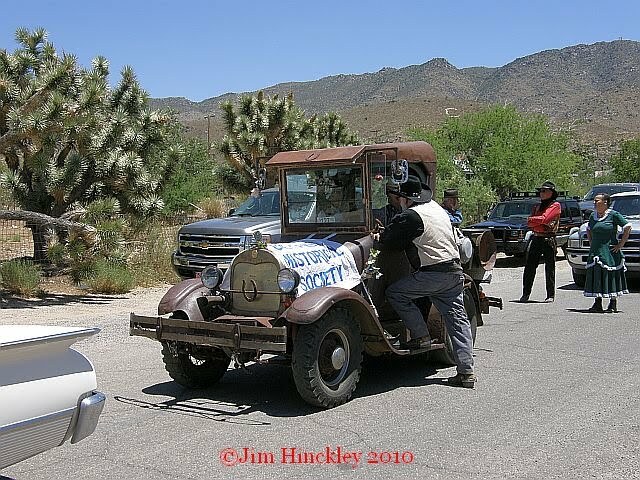 How can I resist the temptation of a festival that features hokey gunfights, the strangest swap meet on earth, and a parade that includes solar powered golf carts with an evaporative cooler on the back, horses, model A Ford powered rat rods, vintage convertibles, a vintage hearse turned “El Camino”, and Shriners?